The Timneh African Grey Parrot (Psittacus erithacus timneh) is the smaller of the African Grey Parrot species at approximately 10 inches (26 cm) in length and weighing approximately 10.5 ounces (300 g). Timneh African Grey Parrots are a dark charcoal gray with a pinkish or horn-colored upper mandible (beak) and a dark maroon colored tail. If you look closely, you will see a beautiful scallop type pattern on the tips of their feathers. The origins of the Timneh African Grey Parrot are concentrated in the western coastal regions of Guinea, Ghana and the Ivory Coast of Africa. Timneh African Grey Parrots begin to talk at approximately 6 months to a year. It is believed that they talk sooner than Congo African Greys because Timneh African Grey Parrots mature quicker. Timneh African Grey Parrots are great talkers and can have an extensive vocabulary of hundreds of words. They mimic many voices and sounds. Unlike the Congo, their voices are not an exact replica of the person's voice they are copying. Timneh African Grey Parrots have their own special little voice - I like to refer to it as a "munchkin" voice as it is so cute. And yes, they do talk in context! Some people believe the Timneh African Grey Parrot is the calmer and more flexible of the subspecies. Feather plucking does not seem to be an issue with these little guys as it is with CAGs. 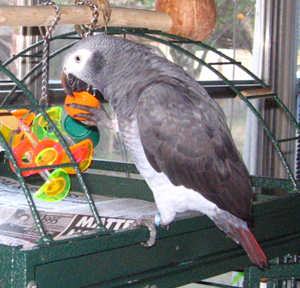 The Timneh African Grey is more apt to continue playing with their toys and talking when other people besides family are around.